Once upon a time, I was an administrative assistant for a busy car dealership. I LOVED my job and my employers loved me. It was the perfect job for me. One thing I always looked forward to was my lunch break. I would usually go out to my car and enjoy my lunch or, if it was a nice day, would sit outside at the company's picnic table. I always packed my own lunches and enjoyed changing up my menu on a daily basis. I ate alot of salads and fresh fruit and even when I ordered out for lunch, I would get salads on occasion. My containers that I used for lunch salads were pretty plain...and trying to transport salad dressing was just messy business. I loved my salads but boy, did I need a better system for bringing them to work and having them stay fresh until lunch time. ROVE is a mobile lifestyle brand with products to hydrate and nourish you on the go. The rove® collection consists of innovative reusable tumblers, mugs, water bottles,travel mugs, sport bottles, lunch boxes, and lunch bags. ROVE strives to make you as comfortable outdoors as you are at home. I was excited when I was contacted and asked if I would like to review some of ROVE's products because even though I am no longer working outside the home, my hubby does and he takes lunches to work daily. He is always needing containers and recently, has been taking salads to work. He needs a good salad container, which is one item that ROVE carries and it is awesome! So, for this review I was sent three ROVE Eco-Friendly products: the 7-Piece Laptop Iced Bento Lunch Box, the 14-Ounce Double Wall Hot & Cold Hydration Mug and the 20-Ounce Double Wall Flavor Infuser Tumbler. First of all, I am in love with the lunch box...for a number of reasons. This lunch box isn't massive in size, which makes it very transportable. There are clips on either side of the container to lock the lid down and a convenient carrying handle as well. How many of you have gotten to work and sat down to eat only to realize that you forgot your silverware?? Well, this handy lunch box comes with a durable fork and spook that clips onto the inside of the lid. That way, you wont ever lose your silverware again! I also love that there is a leak proof compartment for any types of sauces or liquids you might have to bring with you. That would have solved alot of problems for me when I was working. Last but not least, there is a non-toxic, removable freezer gel pack that keeps your lunch cold and fresh. I didn't always have a refrigerator to stick my lunch in when I worked so that would have been really handy to have. 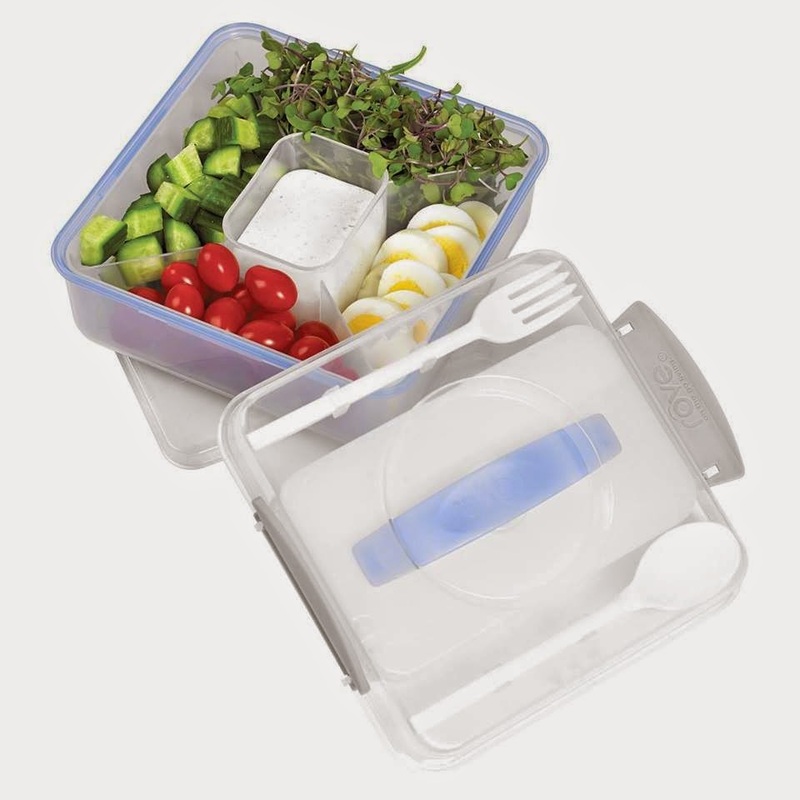 If you have a lunch that doesn't need compartments, just pull out the insert and use the box itself. This lunch box is amazing, and it retails for $12.99. The 14-Ounce Double Wall Hot & Cold Hydration Mug is pretty cool as well. The color I was sent just happens to be my favorite color. :) Double coolness (is that a word??) there. This mug can hold hot or cold beverages and has a nice rubber grip around the top so you can keep a good hold on it. The lid is unlike anything I have seen before. To use the mug, simply press the white button and sip away! There isn't a "spout", but rather a 360 degree drinking lid. That is pretty neat. This Mug retails for $7.99. Last but certainly not least is my soon-to-be-favorite tumbler for the summer. The 20-Ounce Double Wall Flavor Infuser Tumbler makes sipping on cold beverages twice as much fun, simply because you can add exciting flavors to any beverage! This handy tumbler comes with a unique flavor pod, into which you can place frozen fruit, fresh fruit, herbs and whatever else you like to add to your drinks. One thing I love is that the straw has a larger end so it doesn't come out of the cup when it is pulled all the way to the top. I hate losing straws. The straw is also very durable and I love how the lid has a silicone ring inside of it to prevent leaks. Again, there is a nice protective sleeve to keep your hands dry, while helping you to keep a firm grip on your tumbler. I love infusing my water with lemon and cucumber and this tumbler will be fantastic for that! I can't wait. :) This Double Wall Flavor Infuser Tumbler is retailing right now for $8.99 (normally, it is $17.99!!). Disclaimer: I received no monetary compensation for this post. I did receive free ROVE products for review purposes. All quotes and stock photos are from the ROVE website and email. All thoughts and opinions are 100% mine.